History of Kona Coffee – Rich as its Taste! History of coffee in Kona is as rich as its taste! With an area of over 4,028 square miles, the island of Hawaii, also known as “The Big Island”, is home to a beautiful region in the west known as the Kona District. The Kona District is home to many different and wonderful attractions, including the Hawaii Ocean Science & Technology Park, the world-famous Ironman World Championship, the rugged “Gold Coast” with some amazing beaches, sea-turtle habitats, and Kona coffee farms. Coffee isn’t native to Hawaii — it was brought to Kona by Samuel Reverend Ruggles in 1828. He brought arabica cuttings from Brazil to see how well it would take to the Big Island’s climate. As it turned out, Kona’s daily cycle of morning sunshine, afternoon cloud cover and rich volcanic soil was perfect for the coffee plants. Consequently coffee established itself as a major crop in Hawaii by the end of the 1800s. A crash in the price of coffee in the late 1890s led to today’s system of independent family farms. The plantations which had been producing most of the coffee beans were forced to sell their land. As a result the workers bought or leased the land. Generations later, many of these plantation worker descendants are still farming Kona coffee on the same land. 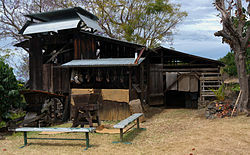 Harvesting and Processing – little change throughout history. 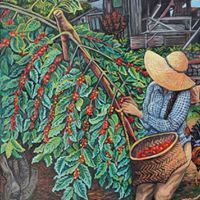 Harvesting (picking) and then processing coffee is a tradition in Kona that you’ll see typically from August to January. Farmers and hired pickers collect the red coffee berries. These berries contain the coffee beans. Then they pulp the fruit. Also known as “wet milling”. Separating the inner bean from the skin or outer layer. The sun, breeze and consistent raking dries the parchment beans. With the exception of some machinery this is the same system used for generations. Then after dry milling the green beans are roasted, bagged and sent around the world. And finally, into your coffee cup. 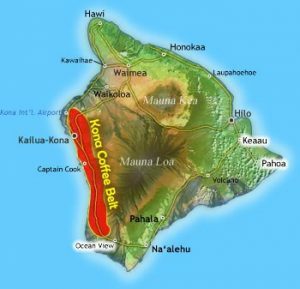 Hawaiian coffee has a rich history of coffee production, though it is a relative newcomer to the coffee industry. Mark Twain said Kona coffee has a richer flavor than any other. Samuel Reverend Ruggles introduced it in 1828 from arabica cuttings he brought from Brazil. 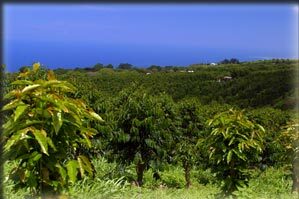 Coffee grows very efficiently in Kona on both large and small plantations. Java Lovers, Beware of the Coffee Borer Beetle! Kona Coffee is at risk as the coffee borer beetle destroys coffee crops! 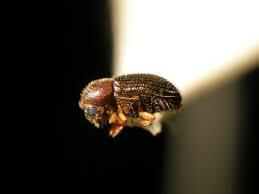 Some know it as the berry borer beetle or the coffee borer beetle. However, this African pest is now invading Kona and is a real threat to its coffee. This pest is about 1.5 mm long. Females can fly short distances but the males do not have wings. The beetle costs the coffee industry over $500 million each year. Due to Kona’s small harvest, a coffee borer beetle infestation would be devastating. Continue reading Java Lovers, Beware of the Coffee Borer Beetle! Processing Kona coffee beans, from harvesting the cherries on the trees to roasting the beans, is an extremely labor-intensive process. Coffee cherries, red when they’re at the peak of their maturity, are picked by hand from the months of late August to January. The cherries are fermented and washed in clean, fresh water. Then wet milling separates the beans from the outer skin. The beans are then dried. Next they are dry milled to separate the parchment skin from the green beans. And finally the green beans are roasted and bagged.